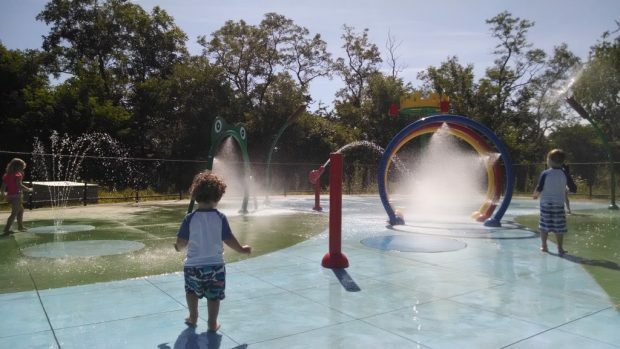 When the heat of the summer began, I decided it was time to research splash parks around us. I had been to one in Boston and Cambridge, but was hoping that I could find one closer as well. I was pleased to read about two that weren’t too far away. We ventured out to Braintree to check it out, not really knowing what to expect. After being directed by a town park employee to park in the upper parking lot by the Beach, we made our way down the dirt path to the Splash Pad. The walk to the Splash pad alone was beautiful. It runs right next to the ocean, sending you past a picturesque beach straight to Watson Park. Towards the back of the park, there were lots of large yachts which my kids thought was really neat. When we finally made it to the Splash Pad, I was so impressed by what I found. A brand new, colorful, innovative water world for kids of all ages. There were sprinklers and showers of all kind, a water tunnel, buckets dumping from poles and even water pistols. Kids from 12 months to 12 years were all having fun together. Both kids changed into their bathing suits and ran in to cool down, splishing and splashing away the morning. Definitely a great find for a hot day and a nice change from the beach or pool.